Egypt’s shift to renewable energy has helped create many job opportunities, experts say, with the industry expected to grow further over the next few years. “Renewable energy is more job-intensive compared to traditional energy projects,” said Axel Ceglie-Swoboda, chief technical officer of Solar Al-Shams Company for New and Renewable Energies, which operates in Egypt. More people are needed to install, operate and maintain renewable energy projects, he said, speaking at the the 51st Cairo Climate Talks which were held on Tuesday. Germany’s ambassador to Egypt, Julius Georg Luy, also highlighted during the Cairo Climate Talks how the development of the renewables sector could benefit the economy and the labour market in Egypt. 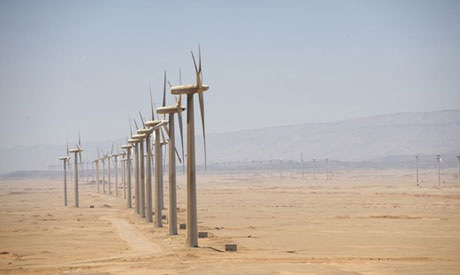 “The sector has vast growth potential in Egypt with ambitious plans to increase renewable energy projects,” he said, adding that the sector is growing exponentially worldwide due to newer technologies, lower costs and supportive government policies. To give an idea about how developing the renewables market can create jobs, Luy said that employment in the sector in Germany has doubled over the last 10 years, and that there are around 10 million people around the world working currently in the renewable energy sector. He also stressed the importance of education and capacity building to the development of the sector, adding that Germany and Egypt are strongly cooperating in this area. Ceglie-Swoboda believes that the Egyptian government’s plan to lift subsidies on electricity will boost growth in the renewable energy market, because it will be more attractive for new investors . In 2015, electricity prices were scheduled by the Ministry of Electricity and Renewable Energy to increase gradually until they reached the real cost of production, at which point there will be no more government subsidies of electricity. The plan is to reach that goal by 2022, which is also a target year by the ministry for 20 percent of electricity to come rom renewables; that rises to a target of 42 percent by the year 2035. There were about 8,800 people working in the field of renewable energy and energy efficiency in Egypt as of the end of 2016, according to Maged Mahmoud, technical director and renewable energy expert at the Regional Center for Renewable Energy and Energy Efficiency. There are more than 200 companies working in Egypt in the field of renewable energy, mainly solar, he added. “Based on assessments of the 2035 plan, there will be 28,000 direct and indirect jobs expected to be created, with the right regulatory framework and policies,” Mahmoud said, adding that new and modified regulations like the new net metering system has made more companies interested in investing in renewable energy projects. Net-metering is a billing system in which individuals or businesses generate their own electricity using solar cells and feed the excess power to the national grid at fixed prices. These prices are now more appealing with the rising prices of traditional electricity sold by the ministry. The benefits of decentralisation achieved by renewable energy installations also include creating sustainable jobs for people in villages and rural areas, according to Ceglie-Swoboda. “They can stay at their villages for operation and maintenance jobs without thinking about moving to the capital to find work,” he said. Another major benefit of renewable energy as a new market is that it has a higher share of people who are really convinced of renewables and can see the importance of these green energy sources, said Nikolaus Supersberger, program coordinator at the Egyptian-German Joint Committee for Renewable Energy and Energy Efficiency. “People who work with renewables understand how they shape the future of energy,” he added. However, experts agreed that there is still a gap between theoretical and practical work in the renewable energy field in Egypt that can make it hard sometimes to find technicians and workers for certain tasks. “Graduates spend a long time on job training when their education should make them more ready,” said Yassein Abdel-Ghaffar, co-founder of Solarize Egypt. Many entities provide training workshops to try to fill that gap, but they all need to be coherent and fitting to the local industry, said Mahmoud. There are 28 courses related to renewable energy projects and technologies available in universities across Egypt for engineering students, Mahmoud stated. There are also high technical schools and specific curricula like the ones established in Aswan and Hurghada. A new curriculum developed by the US Agency for International Development (USAID) in partnership with the Egyptian Ministry of Education will help over 300 technical school students in Aswan and Hurghada specialise in renewable energy and prepare them for employment in solar and wind power sectors. Minister of Electricity Mohamed Shaker inaugurated on Tuesday the first phase of Egypt's Benban solar park in Aswan, set to be one of the largest in the world upon completion at 1465 megawatts of total capacity, and with investments worth $2 billion. Still, Supersberger believes there should be more focus on vocational training in Egypt. “Vocational training is the beginning and end of everything to get the renewable energy market going,” he said.